Most summery dinner tables look like this: Six glasses of red wine, two bottles of red, three bottles of white, some glasses of bubbly leftover from the early birds and enough glasses for water and/or Pimms and lemonade. Suddenly, there's nowhere to actually put your dinner. The salad bowl ends up on the lawn with the cat trying to nibble at the rocket and all of your nice not-really-for-outdoors things get broken. 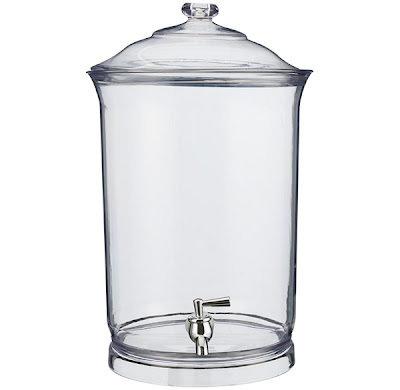 That's why these drinks dispensers from John Lewis are such a good idea. Instead of having wine bottles and pitchers and bowls everywhere, you've just got one snazzy drinks dispenser on the go. 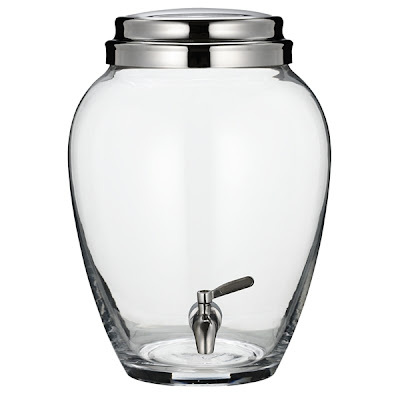 You've got two choices - you can go for the curvy glass dispenser which is £60 (best for non-clumsy folk) or choose the much cheaper acrylic one for just £16. That one is very garden friendly. The best thing? Now you've freed up more table room, you've got space for more food. You're welcome! As much as I love the shape of the top one, the cylinder option is much more practical.